By Shahid Khan Minorities in Pakistan make around 3% of total 190 million strong population. They include, Christians, Hindus and Bahia’s etc. These religious minorities have long been battling for equal rights in a country which is dogged and disfigured with political instability, corruption, and abject poverty. The debilitating economic situation and lack of good governance has further deepened the worries of a common man in general and members of Minorities in Particular, who are deemed as second or third class citizens in a country, where members of minorities have played a pivotal part in the overall prosperity of the country. However, minorities are being rewarded with bullets and bombs where they are cut like carrots, in whose lands, their forefathers shed their precious blood to get this piece of land. Today the dwellers of the same land have stood to wage war against its progeny. Minorities are considered as “Aliens” or “Infidels” who have no right to live and to exercise their faith. Even if they do, this right is sometimes snatched, or taken away from them by the will and power of the majority of members who consider minorities as “Spoils of war”. The current climate has further flamed the fire of sectarian violence in Pakistan which has claimed hundreds of innocent women, kids and men. Members of such communities are killed, bombed persecuted and violated make these terror-stricken, vulnerable people open to never-ending violation. On Saturday, 16th of February, the city of Quetta experienced another horrible suicide attack which killed more than 89 people and injured around 180 innocent people. 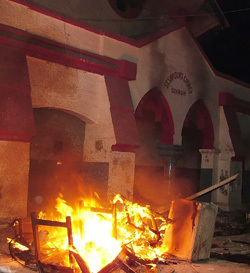 The attack was carried out by an Islamist militant organization, Laskhar-e-Jangvi which has close connections with Al-Qaida and responsible for other sectarian violence across the country. They also took the responsibility of the last attack on Shiite community in January, which left 90 people dead and it called for protest until Government of Pakistan intervened and appointed a governor rule in Baluchistan province of Pakistan. The recent attack on Shiite has further put minorities in Pakistan on the front-lines of persecution. It has also raised concerns among people and the International community if minorities will ever be safe in Pakistan given the country’s profile where minorities are being targeted on a daily basis. 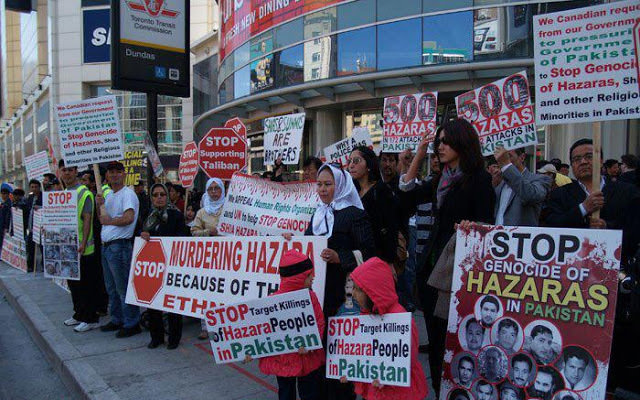 Thousands of people thronged and staged a sit-in on Monday in the big cities of Pakistan like, Karachi, Quetta and Islamabad demanding for military intervention for the safety and security of the Hazara community which is per-dominantly Shiite- as one of the factions of Islam, who believes in Ali, the son in law of Prophet Muhammad and his cousin as the successor. However, Sunni Muslims do not consider Shiites as Muslims and they are treated like “Infidels” which makes bombing even more “Holy” and sadly “justifiable”. Alone is 2012 more than 450 Shiites Muslims have died in different attacks on their mosques and processions. The families of the victims are unwilling to bury their dead until the military is intervened to protect. The Government of Pakistan has failed to protect the lives and properties of minorities in Pakistan and this bloodbath will continue in other cities or find another community or minority in Pakistan as their “scapegoat”. Christians, which are the biggest minorities in Pakistan are also going through hard times while they are implicated into blasphemy laws when they are falsely accused by majority Muslims. They can languish years upon years until their appeal is heard, or they are killed extra judicially either by police, or by the members of the public. A poor Christian farm hand, mother of five, Aasia Bibi, is pending an appeal after she was accused of using derogatory words for Muhammad in June, 2009. She became the first woman in the history of Pakistan to be given a death penalty. According to Human Rights Commission of Pakistan since 1998 there are more than 1000 cases lodged for desecrating Holy Quran and around 50 cases have been lodged for blasphemy against Prophet Muhammad. Countless Christians have been accused of blasphemy around 12 of them have been given death sentences. 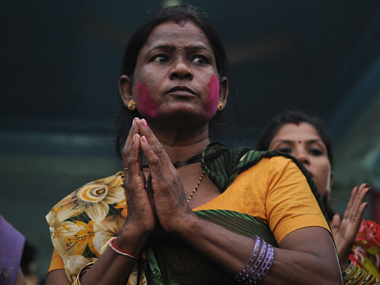 Hindus, the second largest religious minorities in Pakistan are also facing endless persecution. Lots of Hindus are migrating to India owing to the routinely persecution they are undergoing in Pakistan. Sindh, one of the four provinces of Pakistan, is home to more than 7 million Hindus. The community is facing inhuman and degrading treatment from the majority Muslims who often treat Hindus like “untouchables”. Their businesses, houses, and communities are threatened by influential feudal Lords. Their temples are often disgraced and Hindu girls are forcibly married to Muslim men, the cases of kidnapping, and rapes are rampant in Sindh province. The lives and properties are not safe for minorities. Due to the inherent bias and prejudice against the non-Muslims, minorities are often treated as scums of the earth in Pakistan. Members of minorities are cut like carrots in Pakistan. A worthless existence in their own homeland they are treated worse than refugees. They do not have a right to live. The Government of Pakistan has to ensure the rights of minorities. They have to be made equal citizens of Pakistan. They have to be treated with respect, honour and dignity by other members of the society rather than taken as “nobody” and open to plunder and pillage. This entry was posted in Pakistan, Persecution. Bookmark the permalink.